God places much of the burden of what we will become on our response to Him. If we have drifted from God, His call is to return to Him. God promises that if we will return, He will immediately renew His relationship with us. James 4:8 promises that if we draw near to God, He will draw near to us. Matthew 7:7 guarantees that if we seek Christ, we will find Him. Much of the Christian life rests upon our response and our desire to experience God to the fullest. Why is it that some Christians seem to go so much deeper in their walk with God than others? Why have some had such powerful intercessory prayer ministries that have changed the courses of nations? Why has God chosen to anoint the words of some so that, when they speak or pray or preach, it is obvious that their words are consecrated by God? It is because these individuals have committed themselves to pursue God until His presence is powerfully real in their lives. They have decided to settle for nothing less than a vibrant relationship with God, and He has honored their desire. Have you become complacent with your relationship with God, or are you hungering for more? Don’t become satisfied with a relationship with God that is broken by sin and void of the power of the Holy Spirit. 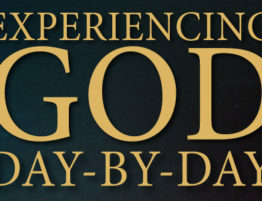 You have just as much of God’s powerful presence available to you as the greatest saint in Christian history! Return to God. There is so much more in store for you if you will return to Him. He awaits your response.